Following up creepy Christian Bale and tiny Gary Oldman, Hong Kong collectible company Hot Toys will also be releasing incredibly realistic Dark Knight Rises replicas of villain Bane and Batman's old Tumbler. If you were hoping they'd be available in time to take with you to theatres, though, you'll be disappointed. 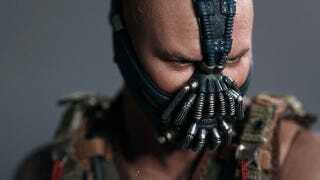 Bane ($195) won't be out until March 2013 and the enormous, 13kg Tumbler ($470) won't be out until September 2013.